No matter what level of skill you possess personally, or the level of complexity contained within your business’ marketing automation setup, the beauty of this (still) lesser known specialism is that it forever changes. And equally there are fundamental pieces of knowledge that get overlooked. I know this personally, and treat every day as a school day. In addition, I like to share things I have learned along the way - either to help those who are on their first journey into marketing automation, or to provide food for thought for the more experienced practitioners alike. We would like to think by the very name that marketing automation is a magical button you press and all of our work just gets completed for us. But it actually takes great skill, planning, knowledge, attention to detail and a lot of elbow grease to deliver exceptional automation programs. However, the end results are amazing and it is a massively rewarding process both for individuals, teams and businesses. Do not underestimate the amount of time you need to get a marketing automation system setup initially, or to get everything ready for an automation-driven marketing campaign launch. Simply make sure you have a contingency in place so you can get everything prepared and double-checked (you will thank yourself in the long run). It takes many different disciplines and a wide mixture of skills to get the most benefit from using a marketing automation methodology in your marketing efforts. You need to make sure you have the right blend of people to contribute to making everything you do a success. This one is self-explanatory. Make sure that you test everything that you do. Set a benchmark for results and then A/B test emails, landing pages, publish or broadcast times and more. This allows you to get real results and tailor future activity. This point is actually totally separate to marketing automation altogether. To make sure your campaigns work and generate the results you need, you must get the design, messaging, content offer and proposition right in the first place. The technology is great but it cannot create an emotional response so, make sure you balance great technical solutions with solid marketing fundamentals. 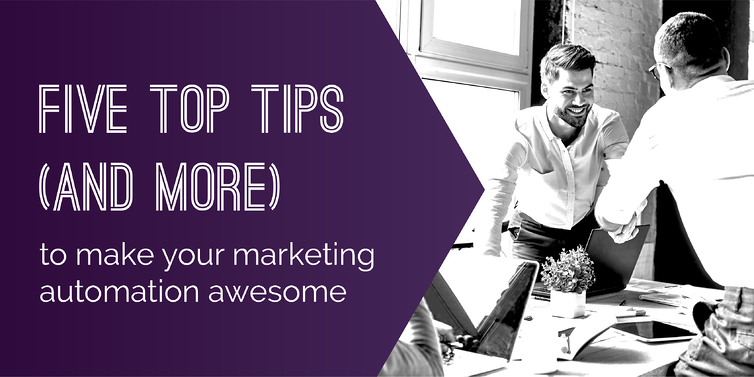 If you need more than just these five tips, you are in luck, as I have put together “20 insider tips you need to know about marketing automation”. The tip sheet covers everything from marketing automation implementation and data management, through to required skill sets and advanced marketing automation features. I hope that it gives some pointers that will help you on your own marketing automation journey, and serves you with some useful snippets of information and inspiration. Get your copy of the tipsheet now!